October is the best. The intense heat and packed schedule of the summer finally gives way to cooler days, beautiful fall foliage, and a more relaxed routine. It’s historically been a time for harvest festivals around the world, and one doesn’t think of October celebrations without thinking of Oktoberfest. The first Oktoberfest took place in Bavaria (Germany) in October 1810 to celebrate the marriage of Princess Therese of Saxony-Hidburghausen and the Crown Prince Ludwig (later King Ludwig I). Apparently the folks had such a good time they decided to continue it year after year. In 1818, Bavarian brewers started brewing a specialty märzen for the occasion, which became known as Oktoberfestbier. Märzen is a balanced, amber-colored lager that was traditionally made in March, conditioned in caves over the summer, and enjoyed in the fall. Around this time and continuing into the 1850s, a large amount of German immigrants settled in the Wisconsin area, establishing traditions that we still enjoy today, such as brewing beer and celebrating Oktoberfest. Today, breweries across the country brew Oktoberfest beers, some following tradition, others using unusual ingredients or experimental aging processes. Here’s a look at how brewers in the Chippewa Valley interpret Oktoberfest beer. Readers of this magazine are familiar with Lazy Monk’s Oktoberfest beer; you voted it the third best local beer in the Chippewa Valley this year in our annual Best Of poll. And for good reason. Brewer Leos Frank sources ingredients for the Oktoberfest from Germany, using Munich, Czech pilsner, and caramunich malts. The caramunich malt gives the beer an orange-amber color and a sweet, biscuit-y flavor. It’s bright and balanced with just a wisp of hops at the end. Leos recommends pairing it with bratwurst, pretzels with spicy mustard, knockwurst, sauerkraut ,and good friends. “Beer is all about being with friends and relaxing,” he said. Outside the taproom Oktoberfest is available at grocery, liquor and convenience stores. The Brewing Projekt is known for brewing experimental beer using unorthodox ingredients like coriander, ginger, raspberries, coco nibs, chipotle peppers, green tea, citrus zest, or oats. But head brewer Eric Rykal went back to märzen’s German roots when he created Wisktoberfest beer. Using North American malts and hops he created a straight-up Oktoberfest märzen lager. Why? Because it’s beautiful and crazy tasty, with an excellent balance of sweet malts and bitter hops. Eric recommends pairing Wisktoberfest with a Rueben sandwich. Outside the taproom Wisktoberfest is available in most grocery or liquor stores and at a variety of bars and restaurants. “Brewing Oktoberfest gives the whole brewery a smell like warm bread that reminds you of your grandma’s house. It makes you feel warm and safe.” – John Buhrow, head brewer at the Jacob Leinenkugel Brewing Co. The Leinenkugel family opened the Jacob Leinenkugel Brewery Co. in Chippewa Falls in 1867, making it the oldest brewery in the region. Head brewer John Buhrow has been there 42 years and says Oktoberfest is one of his favorites to brew. “Brewing Oktoberfest gives the whole brewery a smell like warm bread that reminds you of your grandma’s house,” he said. “It makes you feel warm and safe.” Leinenkugel’s Oktoberfest is made from Munich malts and old-world Haullertau, Perle, and Tettnager hops grown in Germany. Buhrow cold ages this copper-colored beer for at least 20 days to give it its crisp, bright, delicious flavor. It’s available in the Leinie Lodge, in nearly every store in the area, as well as many bars and restaurants. John recommends pairing Leinie’s Oktoberfest with steak, venison, or a heavily seasoned salad. For the last five years, Leinenkugel’s has also brewed Big Eddy Über-Oktoberfest. This big bodied, slightly hop-forward beer is actually an ale, but the flavors are still in line with märzen. Über-Oktoberfest is available at grocery and liquor stores through October. K Point Brewing opened in May 2016 in the space adjacent to The Coffee Grounds, making this spot the newest brewery in the Chippewa Valley. Lon Blaser and Tom Breneman brewed their first Fest Bier using an authentic recipe – pilsner, Munich and Vienna malts; Noble hops and yeast all sourced from Germany. The end result is an amber-colored, crisp, balanced, strong beer that’s the definition of relaxing with friends. 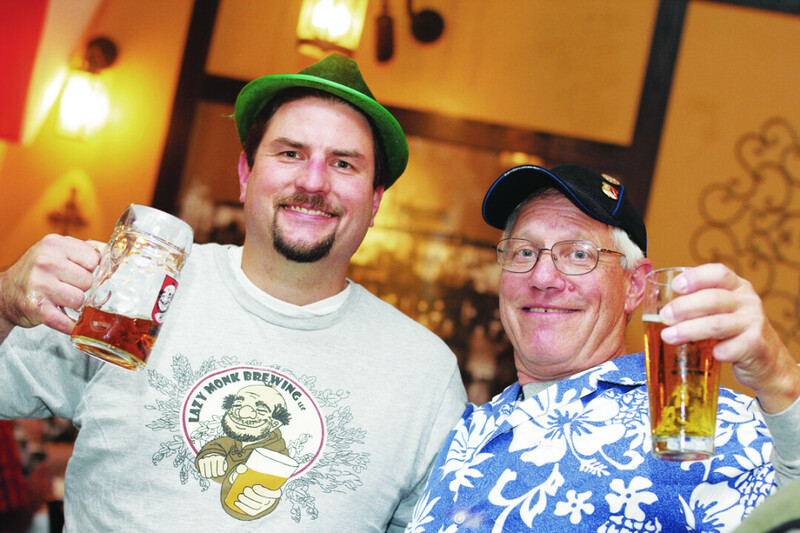 Lon and Tom recommend pairing the Fest Bier with traditional German or Czech food such as Braunschweiger with onion on a bun. Will Martin, the chef at The Coffee Grounds, puts items on the K Point Brewing menu like burgers and a smoked beef sandwich that pair well with the Fest Bier. Fest Bier is currently available only in the K Point Brewing taproom. Limited kegs and growlers are for sale on-site, and soon they will start operating a crowler machine, which makes 32-ounce cans of beer to go. The Chippewa River Distillery and Brewster Bros. Brewing Co. opened in March 2016, so this is the first year head brewer Jim Stirn brewed West River Oktoberfest Lager. Using German malts and yeast combined with North American hops, his is the deepest amber-colored märzen in the Valley. Märzen usually shows golden colors around the edge of the glass, but this beer is shades of red all the way through, with a crisp finish that sparkles on the tongue. Jim suggests pairing the West River Oktoberfest Lager with German foods and grilled meats. I would also suggest Bavarian Landjager sausage, Bavarian beef, summer sausage, or a Laugenbrezel mit salz (pretzel with salt), all available in the taproom. Outside the taproom, West River Oktoberfest Lager is available at the Fill-Inn Station, the Sand Bar, Crescent Tavern and the Wissota Chop House. Ironically, Oktoberfest beer in Munich has evolved from robust märzen to Helles light golden lager. But here in the Chippewa Valley, our brewers stick with Wisconsin’s roots, keeping the 1800s recipes alive. Consciously or not, when they created Oktoberfest beers they followed the German beer purity law, Reinheitsgebot [pronounced Rhine-heights-gah-boat], which states that a brew can contain only water, malted barley, hops, and yeast in order to be called beer. But don’t expect them to stick to tradition when brewing other beers. As the leaves fall, our Chippewa Valley brewers are creating experimental and inspired porters, stouts and winter beers that are nothing like what Bavarians or the first immigrants brewed. And for us, that’s reason enough to get out of the house during a long winter.